NEW YORK If you don't like coffee or tea, Mountain Dew has a new breakfast drink that might perk you up. PepsiCo (PEP) is rolling out a new drink called Kickstart this month that has Mountain Dew flavor but is made with 5 percent juice and Vitamins B and C, along with an extra jolt of caffeine. PepsiCo said it doesn't consider Kickstart to be an energy drink, noting that it still has far less caffeine than drinks like Monster and Red Bull and none of the mysterious ingredients that have raised concerns among lawmakers and consumer advocates. But Kickstart, which comes in flavors such as "energizing orange citrus" and "energizing fruit punch," could nevertheless give the company a side-door into the fast-growing energy drink market without getting tangled in any of its controversies. The drink comes in the same 16-ounce cans as popular energy drinks made by Monster Beverage (MNST), which also offers options with juice content. And the TV ad features young men skateboarding, reminiscent of the marketing themes used by energy drink makers. The promise of "energy" has been a big seller in the beverage industry in recent years, with the energy drink market increasing 17 percent in 2011 even as broader soft drink consumption has continued to decline, according to Beverage Digest. PepsiCo and the Coca-Cola (KO) have largely watched that growth from the sidelines, however, with players such as Monster Beverage and Red Bull dominating the market. 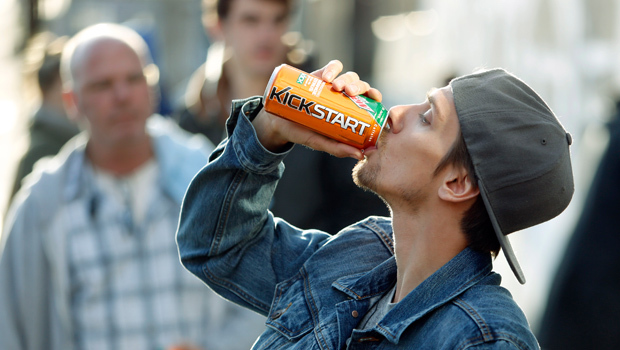 Though Kickstart may look like an energy drink, it has far less caffeine, at 92 milligrams for a 16-ounce can. A comparable amount of regular Mountain Dew would have 72 milligrams of caffeine while a can of PepsiCo's Amp energy drink has 142 milligrams, according to the Center for Science in the Public Interest.